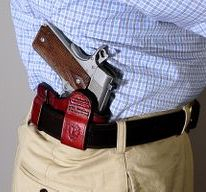 A more traditional IWB, behind the hip holster. Panoply's Un-Skirted Double Loop model utilizes a muzzle rearward cant to gain proven concealment and still allow a you to gain a master firing grip before breaking leather. In order to reduce weight double layering of leather has been minimized and the stabilizing skirt has been removed. Adding a second loop regains stability, and minimizes shifting along the belt. Steel reinforcement keeps the holster open when the gun is drawn and allows you to maintain the desired tension for the lifetime of the holster. A molded sight channel and countersunk interior stitch lines create a snag free path for the front sight and ejection port. 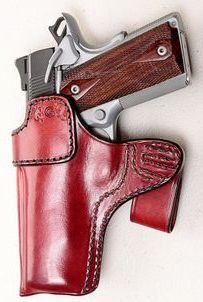 Ensuring a reliable draw stroke and leather free front sight, as well as dramatically extending the life of the holster. Hand tooling of the leather is only done on the outer side of the holster. The side against the body is left as smooth as possible for added comfort while still providing a secure, custom fit for your gun model. The version shown here has a half length body shield. 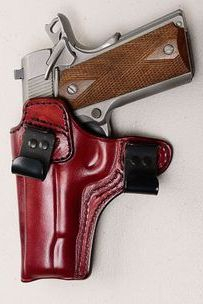 This feature lowers the front of the holster to the belt line allowing the muzzle to clear the leather with minimal upward movement of the gun. The short wings help keep your shirt out of the way when holstering, but still allow an unobstructed master grip to be gained. 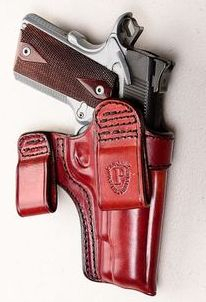 The design and positioning of the loops provides several options for attaching the holster to the belt. 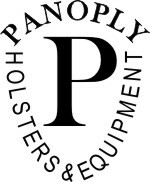 In addition to sewn on loops and "Pull the Dot" snap loops, Panoply has developed a unique Kydex clip system that utilizes the strengths of both leather and Kydex. As many shooters have found Kydex is a versatile and in many ways very durable material, but it doesn't hold up well when repeatedly flexed. By riveting the Kydex clip onto a sturdy flap of leather no flexing of the Kydex is needed to keep the system secured to the belt. Thus we are able to provide a very stable, long lasting system that's easy to get on and off the belt while producing minimal printing through your cover garment. Sewn on Loops: very sturdy and durable system, this is our suggested option if you don't need to periodically remove your gun throughout the day. "Pull the Dot" locking snaps on leather loops (picture coming soon): Uses the same configuration as the Sewn on Loops but with one "Pull the Dot" locking snap for each loop rather than stitching. Long tested industry standard for those who need to remove the gun without removing the belt. Kydex Clip System: solid, durable system locks securely on the belt and minimal printing. With a bit of practice the gun can be taken on an off quickly with one hand.